South America has a variety of mixed culture. Since the arrival of the Europeans in 1492 the population has become extremely diverse. It would be difficult to generalize about one cultural definition of the continent but is known that a large majority have part of their roots from Spain, Portugal, Africa. Because of the Spanish and Portuguese colonization, mestizos (mixed of natives and Spanish or Portuguese) are also in the majority. In the early 1900’s South America received more immigrants Including Italian going to Brazil, Argentina and Uruguay. Then more significant arrivals to South America has come from Germany, Libya, China and Japan. The mix of culture, the great biodiverse wildlife and the big adventure possibilities is what makes South America so unique. South America offers great travel options for the perfect vacation. Travelling is a good way to get inspired about life. Although, there are more than 2 weeks that we arrived home, we are still in our thoughts there, in your beautiful city Cusco and Machu Picchu. South America Peru tours - SA Peru, can help you plan a memorable trip with many diverse tour options. Exploring the old Inca palaces, hike along Inca trails, witness colorful local celebrations, visit museums with amazing artifacts before making your way to the amazing Amazon Rainforest wildlife, the wonderful beaches, and the marvelous Patagonia. Travel with us, South America Peru Tours - SA Peru. We can offer you trips throughout the most highlighted destinations in South America. 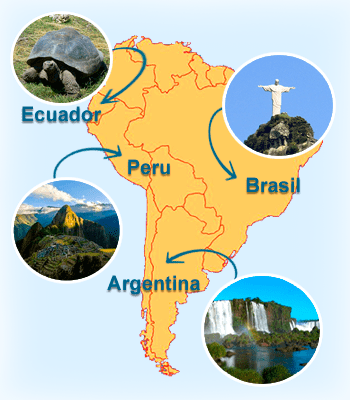 We will take you to the best parts of Peru, Brazil, Ecuador, Argentina y Bolivia. Come with us and enjoy! Machu Picchu, is one of the most popular touristic destination in the world. One of the reasons why google has consider between one of the street view, showing Machu Picchu with the most fascinating pictorial scenes. Visiting Machu Picchu for many travelers is a unique and incomparable experience, with a spectacular location in the top and surrounded of mountains, is the best known archaeological site of South America. It is one of the seven natural wonders of the world.